It will distinguish itself from other state-funded channels by reporting "without fear or favour", BBC World Service director Nigel Chapman said. This is the BBC's second attempt at an Arabic channel. The first closed in 1996 in the wake of an editorial dispute with its Saudi funders. The channel enters a crowded market, dominated by the Qatar-based al-Jazeera and the Saudi-funded al-Arabiya channels. Recent TV channels financed by Western governments have struggled to make an impact, including the US-backed al-Hurra channel in Iraq and France 24 in Arabic. "BBC Arabic is renowned for broadcasting impartial and accurate news and information which is strong on analysis and expertise. [An] enhanced multimedia service meets the needs of an audience with a very strong appetite for news and debate," Mr Chapman has said. Some commentators question whether the BBC can succeed in a region where the UK is criticised for its involvement in Iraq and Afghanistan. 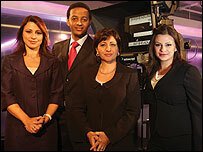 Starting at 1000 GMT on 11 March, BBC Arabic television will broadcast 12 hours a day, shifting to a 24-hour service later in 2008. 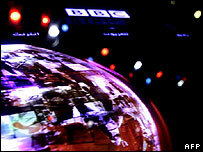 The channel will broadcast 30-minute news bulletins every hour and two main 60-minute bulletins at 1800 GMT and 2000 GMT. It will also carry interviews and debates allowing viewers to submit comments. It hopes to attract 20 million viewers per week by 2010 and 35 million users per week for all three Arabic services - TV, radio and on the web. The channel will be distributed through the Arabsat, Eutelsat and Nilesat satellite systems.